For a former name of a genus of larks, see Galerida. Calendula (/kəˈlɛndjuːlə/), is a genus of about 15–20 species of annual and perennial herbaceous plants in the daisy family Asteraceae that are often known as marigolds. :771 They are native to southwestern Asia, western Europe, Macaronesia, and the Mediterranean. 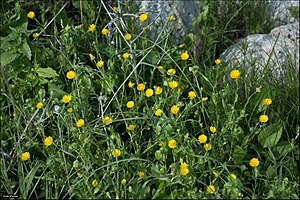 Other plants are also known as marigolds, such as corn marigold, desert marigold, marsh marigold, and plants of the genus Tagetes. The genus name Calendula is a modern Latin diminutive of calendae, meaning "little calendar", "little clock" or possibly "little weather-glass". The common name "marigold"  refers to the Virgin Mary. The most commonly cultivated and used member of the genus is the pot marigold (Calendula officinalis). Popular herbal and cosmetic products named 'calendula' invariably derive from C. officinalis. Calendula ointments are skin products available for use on minor cuts, burns, and skin irritation; however, evidence of their effectiveness is weak. The flowers were once used as a source of dye for fabrics. By using different mordants, a variety of yellows, oranges and browns could be obtained. ^ a b Shorter Oxford English Dictionary (6th ed.). United Kingdom: Oxford University Press. 2007. p. 3804. ISBN 978-0199206872. ^ Spotlight on Marigold. The Complete Herbal - Herbs and Herbal Remedies. ^ Matthew J. Leach (2008). "Calendula officinalis and Wound Healing: A Systematic Review". Wounds. 20 (8). ^ Ukiya, M., et al. (2006). Anti-inflammatory, anti-tumor-promoting, and cytotoxic activities of constituents of pot marigold (Calendula officinalis) flowers. J Nat Prod. 69 1692-96. ^ Yoshikawa, M., et al. (2001). Medicinal flowers. III. Marigold. (1): hypoglycemic, gastric emptying inhibitory, and gastroprotective principles and new oleanane-type triterpene oligolycosides, calendasaponins A, B, C, and D, from Egyptian Calendula officinalis. Chem Pharm Bull. 49 863-70. ^ Okoh, O. O., et al. (2008). The effects of drying on the chemical components of essential oils of Calendula officinalis L. African Journal of Biotechnology 7(10) 1500-02. ^ a b Jimenez-Medina, E., et al. (2006). A new extract of the plant Calendula officinalis produces a dual in vitro effect: cytotoxic anti-tumor activity and lymphocyte activation. BMC Cancer. 6:6. ^ Duran, V; Matic, M; Jovanovć, M; Mimica, N; Gajinov, Z; Poljacki, M; Boza, P (2005). "Results of the clinical examination of an ointment with marigold (Calendula officinalis) extract in the treatment of venous leg ulcers". Int J Tissue React. 27 (3): 101–6. PMID 16372475. ^ a b Pommier, P., et al. (2004). Phase III randomized trial of Calendula officinalis compared with trolamine for the prevention of acute dermatitis during irradiation for breast cancer. J Clin Oncol. 22(8) 1447-53. ^ McQuestion, M. (2006). Evidence-based skin care management in radiation therapy. Semin Oncol Nurs. 22 163-73. ^ a b Bashir S, Janbaz KH, Jabeen Q et al. (2006). Studies on spasmogenic and spasmolytic activities of Calendula officinalis flowers. Phytother Res. 20:906-910. ^ a b "About Herbs, Botanicals & Other Products: Calendula". Memorial Sloan-Kettering Cancer Center. ^ Reider, N; Komericki, P; Hausen, BM; Fritsch, P; Aberer, W (2001). "The seamy side of natural medicines: Contact sensitization to arnica (Arnica montana L.) and marigold (Calendula officinalis L.)". Contact Dermatitis. 45 (5): 269–72. doi:10.1034/j.1600-0536.2001.450503.x. PMID 11722485. ^ a b "History of Calendula". Archived from the original on 2015-09-18. Calendula has been used in cooking for centuries. The flowers were a common ingredient in German soups and stews, which explains the nickname "pot marigold." The lovely golden petals were also used to add color to butter and cheese. The flowers are traditional ingredients in Mediterranean and Middle Eastern dishes. Calendula tea provides health benefits as well as being delicious. ^ Flann, C (ed.). "Species of Calendula". Global Compositae Checklist. Retrieved 31 March 2011.